Nuclear power to open the solar system. In 1992, NASA’s Nuclear Propulsion Office at the Lewis Research Center (LRC) in Cleveland started a joint American-Russian program to develop a small nuclear thermal engine (NTR) for President Bush’s Space Exploration Initiative. The SEI effort quickly foundered, but LRC’s experts, led by Dr. Stanley Borowski, have nonetheless continued to investigate the concept while promoting nuclear propulsion as a realistic alternative for future missions to the Moon and Mars. Borowski’s small NTR “workhorse” would provide 67KN of thrust and produce a specific impulse of 940s using liquid hydrogen fuel. It could be developed in about seven years at a cost of $1.5 billion. The engine would initially be used on a new 4.6-meter diameter upper stage for the Titan IVB, greatly boosting the rocket’s payload capability. A single Titan IVB launch could quckly and easily deliver an orbiter probe to Saturn, Uranus, Neptune; a large 350-kilogram scientific payload on a Pluto “fast flyby” mission; or alternatively land an unmanned cargo package on Mars (rovers, sample return probes etc.) A dual Titan/Shuttle launch and rendezvous in Earth orbit would be sufficient for sending a small Early Lunar Access-type manned spacecraft to the Moon and back. At this point, a Shuttle-derived unmanned heavy-lift launch vehicle and large 7.6-diameter NTR stage would be introduced to support lunar commercialization and settlement and piloted missions to Mars. Perhaps the most unusual of Borowski’s designs, the commuter shuttle would be reusable and permanently based in space. Two heavy-lift Shuttle-C type launch vehicles would deliver the liquid hydrogen propellant from Earth. The smaller 10 meter long cylinder on the upper left is the 15-25t Passenger Transport Module. The PTM is basically an independent spacecraft containing its own auxiliary propulsion, docking, control and life support systems for 18 passengers and 2 pilots. Normally stored at the International Space Station between missions, it would provide the “brains” for the lunar commuter shuttle. The empty nuclear shuttle has a dry mass of about 25 metric tons. Its four-engine NTR cluster would produce electrical power for the spacecraft subsystems as well as sufficient propulsion for a quick 24-36h trip from Earth orbit to lunar orbit. The delta-V (i.e. velocity increase) would be up to 6.9km/s vs. 4.1km/s for a normal 3.5-day journey to lunar orbit. The total mass varies slightly depending on the mission requirements, e.g. the initial mass in low Earth orbit would be 249t (including 59t of liquid hydrogen; the oxygen tank has a capacity of 155t) for delivering a 25,000-kg one-way payload to lunar orbit in 24 hours. The NTR engine is so efficient that no expendable components or “aerobrake” would be required to save weight and fuel. Borowski and his team envisioned an ambitious, phased lunar resource utilization and settlement program. It would be based on two key elements: lunar oxygen mining, and an innovative “trimodal” NTR engine concept developed by NASA/LRC and Aerojet in 1994 — the LANTR engine. The NTR space vehicles would be gradually upgraded for improved perfomance and economy. The expected development cost of the basic cislunar nuclear shuttle was $2.5 billion in 1994 dollars. 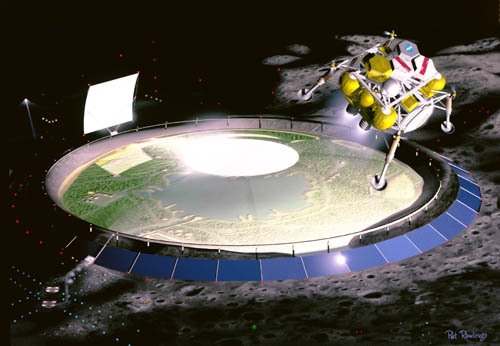 The starting point was a Boeing-developed lunar transfer vehicle concept developed in the early 1990s. It would be powered by chemical rockets and be totally expendable in order to save weight. Despite this, it would require the development of a new large-diameter carrier rocket. Consequently, Borowski & Co. rejected this approach in favor of a nuclear thermal rocket fueled by liquid hydrogen brought from Earth. It would be lightweight enough to be launched fully fueled on two comparatively small heavy-lift rockets derived from the existing Space Shuttle. Following rendezvous and docking in Earth orbit, the spacecraft would transport 9,000-kg moonbase and oxygen mining facility payloads to the lunar surface. The entire spacecraft (NTR stage and Lunar Landing Vehicle) would be expendable in order to maximize the size of the payloads while minimizing the number of costly infrastructure elements in space (propellant depots etc.). Once the surface base becomes operational, the Lunar Landing Vehicle (LLV) can be permanently based on the Moon and reused for several missions. Its chemical engines will burn oxygen propellant mined from the lunar soil, and liquid hydrogen brought from Earth by the next phase NTR shuttle. This NTR is reusable, transporting 8,800kg of cargo from Earth orbit to lunar orbit, where it rendezvous with the LLV. The mass of the entire spacecraft in low Earth orbit is reduced from 132t to 98t since no new LLV must be transported to lunar orbit on each flight. A single Shuttle-C type tanker launch would thus be sufficient. Unlike previous all-chemical Space Exploration Initiative designs, there would be no costly expendable aerobrakes or drop tanks for the fuel. Liquid oxygen propellant exported from the Moon (“Lunox”) is introduced in the next phase. This increases the payload carrying capability by almost a factor of three, and the amount of hydrogen fuel that must be launched (at great cost) from Earth is also reduced. The NTR shuttle is now refueled in lunar orbit by the LLV, which delivers up to 25t of LUNOX for the nuclear shuttle’s return to Earth orbit. Meanwhile, the LLV returns to the lunar surface with 24t of cargo brought from Earth. Its engines are powered by 14t of hydrogen delivered by the nuclear shuttle, and oxygen produced on the Moon. The LANTR engine relies on an innovative scheme to increase engine thrust while reducing the size and weight of the bulky liquid hydrogen fuel tanks. In LANTR mode, liquid oxygen is injected into the large divergent section of the nozzle where it burns sponaneously with the nuclear reactor-heated hydrogen exhaust. As the table indicates, the exhaust velocity in meters per second is reduced in this mode, which means more propellant must be carried. 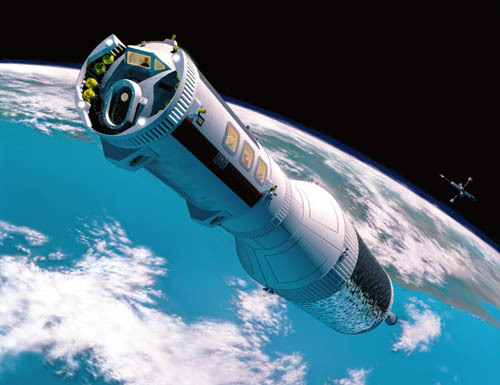 However, the oxygen component can be brought relatively easily from the Moon, the size and weight of the propellant tank is drastically reduced, and the thrust of the engine can be increased — which makes it possible to obtain “big engine performance” from a comparatively small and cheap nuclear engine. Finally, the operating temperature determines the lifetime of the engine. For a reusable nuclear shuttle operating in pure hydrogen mode, a temperature of 2800 degrees Kelvin translates to about 10 lunar missions before a set of new engines are required. However, the engines will last twice as many missions if the shuttle operates with a LOX/LH2 ratio of 3.0, because the higher thrust (182.45KN vs. 66.75KN) reduces the total mission burn time from one hour to about 30 minutes. The 24-hour LANTR “commuter” scenario requires 43t of Earth-supplied LH2, 105 of LOX from Earth and 92t of lunar oxygen. The optimum engine performance would then be an oxygen/hydrogen mass ratio of 4.0 (specific impulse=607s; thrust=431.65KN) on the outbound leg, and a ratio of 6.0 on the inbound leg (specific impulse=545s; thrust=542.9KN). The payload capability would be 15,000kg and the total burn time would be 47 minutes. The Passenger Transport Module (PTM) seen in the foreground was delivered to the lunar surface by the Lunar Landing Vehicle (LLV) behind it. All LLV payloads are mounted horizontally for easy access and improved unloading characteristics. As noted previously, the Lunar Landing Vehicle and LANTR nuclear shuttle act as “tankers” for each other. The LLV transports liquid oxygen mined from lunar soil, while the nuclear shuttle delivers liquid hydrogen from Earth. 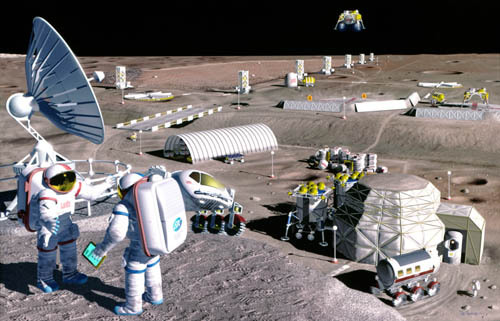 The Lewis Research Center plan features a strong private sector element, since the lunar oxygen mining and production units (the oil rig-like features visible in the background) would be maintained on a for-profit basis by private investors. The accrued cost savings and industry profits from LUNOX would gradually be invested to develop further infrastructure such as propellant depots in orbit, to support full reusability of the LLV and nuclear shuttle. In this picture, a site near Mare Serenitatis (21 deg. N., 29 deg. E.) with abundant iron-rich volcanic glass is surveyed by two lunar industrialists, who discuss planned expansion at the LUNOX facility. To the north, a Lunar Landing Vehicle lifts off from from the Moon carrying a mobile LUNOX tanker vehicle to an orbiting propellant depot in low lunar orbit. In the foreground is a lunar soil-covered inflatable dome for added living space for the government and industry personnel working at the site. This illustration depicts a large settlement located in a crater near the lunar south pole. The pressurized dome provides a comfortable shirtsleeve environment and large open spaces for the colonists. 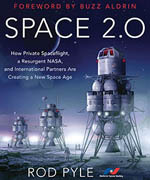 Borowski’s plan turned out to be NASA’s last “grand-scale” lunar exploration proposal of the 1990s. 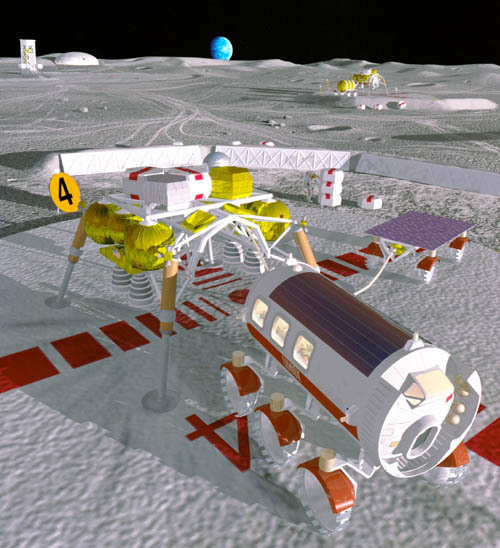 LANTR had many features in common with the old NERVA nuclear shuttle proposals of the late 1960s, but the use of smaller engines and lunar oxygen would have reduced the initial and marginal cost of supporting a moonbase. Reusability appears highly desirable for such vehicles, e.g. the 1970 nuclear shuttle would have cost about $200 million per copy in 1999 dollars. But nuclear propulsion has a political “image problem”, and Borowski’s plan simply proved too costly and ambitious to Dan Goldin’s NASA which was struggling to assemble the International Space Station on cost and on schedule. 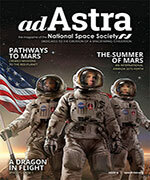 Future NASA administrators will hopefully return to the lunar outpost concept after ISS has been completed.